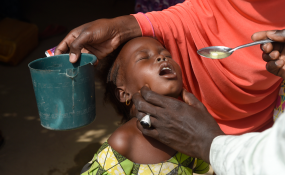 One Year After Polio Set Back, Is Nigeria On the March Again? On 24 October, the World Health Organization (WHO) will join millions of people around the world to observe World Polio Day and galvanize support to end polio, an incurable but completely vaccine preventable disease that still threatens children in a few places around the world. Since the launch of the Global Polio Eradication Initiative (GPEI) nearly 30 years ago, new cases of polio have dropped by more than 99.9 percent - from 350,000 cases every year in more than 125 affected countries to 22 wild polio cases in 2017 in two affected countries. The African Region has made tremendous progress towards polio eradication. As late as 2012, the Region accounted for more than half of the global polio burden, but polio cases have dropped steadily from 128 cases in 2012 to 4 cases in 2016 to 0 cases in 2017 and 2018. The African Region has now reached an important milestone towards eradication - it has been more than two years since the last case of wild poliovirus. I applaud the excellent efforts of governments, polio eradication partners, communities, parents and health workers in achieving this magnificent milestone. However, this is no time to be complacent. Until polio is eradicated, all countries remain at risk of outbreaks. As a Region, Africa can only be certified to have eradicated polio if three years have passed without any confirmed wild poliovirus, and if polio surveillance (closely looking out for polio cases) has been maintained at the level required for certification. If no new case is confirmed and surveillance is quickly strengthened, the African Region can be certified to have eradicated polio by the end of 2019 or early 2020. As a Region, our surveillance efforts need to be further strengthened. A number of countries have sub-optimal surveillance, in both secure and insecure areas. It would be a disaster if we fail to be certified because of poor surveillance performance. I urge all countries - whether they have had a case of polio or not - to recommit to strengthen surveillance urgently. Additionally, as was agreed at the 71st World Health Assembly (WHA) in May 2018, I call upon all Member States to implement containment of polioviruses and potential polioviruses infectious materials according to the global action plan (GAP III), in a timely manner, to avoid any leakage of polioviruses into the environment and populations which could result in catastrophic outbreaks and reverse the gains towards eradication. The progress on polioviruses containment by Member States will be presented at the next WHA in May 2019. The African Region has confirmed continued emergence of circulating vaccine-derived polioviruses (cVDPVs) in some Member States, attributed to weak routine immunization services delivery. In 2017, the Addis Ababa Declaration on Immunization was endorsed by Heads of State at the African Union. It called for governments to invest further in immunization services which are key for stopping emergence of cVDPVs, sustaining the gains towards polio eradication and post certification of polio eradication. Eradication of polio needs political commitment and adequate resources. WHO assures all Member States of its dedicated support. We are close to ending polio. I call on all countries to work together to ensure that this becomes a reality, and the African Region is declared to have eradicated polio by end of 2019 or early 2020. Let us all be part of that historical achievement.